Lenovo’s Superfish adware that was found installed on the company’s notebooks has sparked a lot of outrage in the media, social media and among Lenovo users, only to receive a simple apology, a brush on the shoulder, and a promise to not do this anymore from the Chinese company. Microsoft saw that users were very upset about Superfish on their notebooks, and since most Lenovo notebooks infected with the adware run on Windows, the Redmond giant decided that it would be best if it got mixed up in the situation and tried helping the users out a bit. Today, Microsoft has issued an update to Windows Defender, the company’s built-in virus and adware detection software, which targets Superfish specifically. The response was really fast, as Microsoft usually take their time when it comes to software updates. We’re not surprised to be honest, because the Superfish bug has generated an incredible uproar on social media. In the past couple of days, both #Lenovo and #Superfish kept staying on the trending charts in Twitter, which serves as proof that maybe there weren’t so many people affected by the adware, but there certainly were millions out there who found it offensive. Lenovo is (or used to be) a trusted company, and they are trying to gain the lost trust back with promises of fixes, after making a list of possibly affected computers public, alongside methods of removing and fixing Superfish. Microsoft though it would be simpler for users if they had an automated way of getting rid of the adware, so the Windows Defender update seemed like the best course of action. 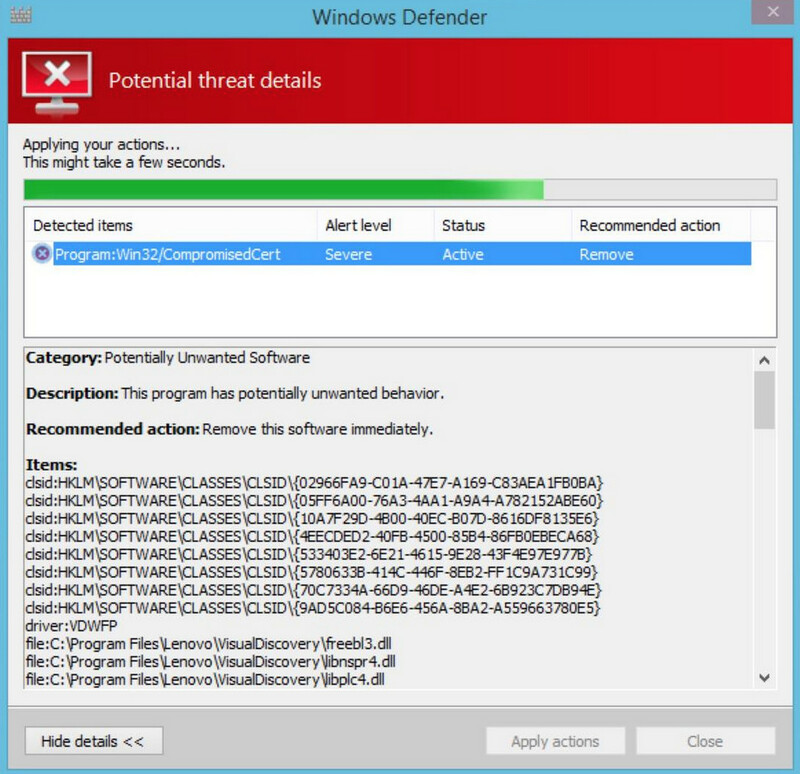 Windows Defender users started reporting today that the software was removing Superfish and related SSL certificates. It must have helped that hundreds of security professionals were already working on issuing a fix for the adware, as Superfish actually makes Lenovo computers vulnerable to man-in-the-middle attacks. It’s funny how Lenovo is unable to remedy the situation created by Superfish, while Microsoft had the fix out in a matter of days. It’s a bit ironic, because Lenovo was the one to install the adware onto computers in the first place, probably unaware about the damage it could have caused. Moreover, Lenovo seemed to try and motivate their injection of computers with adware by saying that they were trying to help users find better, cheaper offers in their search results. That sounds like plain ad-serving to me, but I don’t know about you guys. Microsoft should start getting appraisal from Lenovo soon enough, probably in the course of today. If not, Microsoft can still bathe in the glory of being the one that solved the Superfish problem. Even though the Windows Defender update sent out by Microsoft today will most likely fix all the trouble caused by Superfish, those of you don’t trust in fixes should wipe and re-install anyway. Although, if you don’t trust Microsoft with fixing your stuff, you’re probably not using Windows anyway, in consequence: you’re probably not affected by Lenovo’s Superfish stunt. In any case, the move from the Chinese computer giant is debatable, but most voices within the industry condemn the company for injecting actual adware into their products. Hey, you never know!